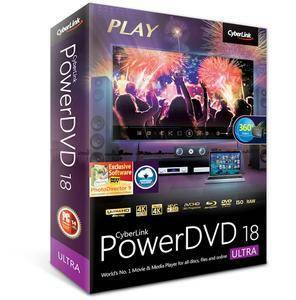 CyberLink PowerDVD Ultra 18.0.2307.62 Multilingual | Free eBooks Download - EBOOKEE! PowerDVD is the must-have companion for PCs and home entertainment systems. It's packed with unique movie, music and photo features indispensable for creating an unbeatably immersive sight & sound experience. And for people looking to create a cinema feel in their own homes, PowerDVD now has world-first technology essential to maximize the potential of your 4K and HDR TVs! If you want the absolute best possible picture and sound, PowerDVD is where you'll find it - unique audio-visual enhancements with TrueTheaterÐ’Â®, along with a brand new ultra-realistic VR experience for those who like cutting-edge entertainment. As great a jump from Blu-ray, as Blu-ray was from DVD. The best home cinema gets! Experience the next big leap in picture quality. Apply HDR enhancement to all your movies! 3D-360 video is a game changer! A mind-blowing experience that puts you right in the video! Enjoy the best quality videos from YouTube, or save them to watch offline at a later date. The most natural, enjoyable movie experience you can have at home on your TV. Enjoy a cinema-quality movie experience from the comfort of your sofa with software that is optimized for big-screen displays. Once again PowerDVD leads the way, bringing the latest in high-resolution video technology to ensure you can enjoy the ultimate in Ultra HD 4K home entertainment. Ultra HD Blu-ray is as great a jump from Blu-ray, as Blu-ray was from DVD. It's the best that 4K home cinema gets! Experience the next big leap in picture quality; brighter, more vivid colors and better contrast. CyberLink's unique TrueTheater enhancements improve the quality of even Blu-ray and hi-def video, and the difference it makes to watching movies on your big screen TV has to be seen to be believed. Immerse Yourself in VR with support for Oculus Rift and HTC Vive headsets, PowerDVD is the must-have player for the next-generation in multimedia entertainment. Explore new worlds in 360Ð’Â° video and photos. New 3D-360 video support makes the whole experience feel even more real! - Stream directly from PowerDVD to your TV through leading media casting devices-RokuÐ’Â®, Apple TVÐ’Â® and ChromecastÐ²â€žÑž. - Cast content that isn't supported by you RokuÐ’Â®, Apple TVÐ’Â® and ChromecastÐ²â€žÑž device. PowerDVD is the best way to save videos from YouTube to your PC so you can watch them offline, or transfer them to your phone to save on data charges. You can even pin 4K and 360 videos! It's also a great way to add to your music collection - PowerDVD can rip audio tracks from any video and save them as music files! For a truly immersive movie experience you need exceptional audio. PowerDVD supports master-quality sound technology from the leaders in professional digital audio-Dolby and DTS. Enjoy the acoustic difference of specialized multichannel audio and lossless audio formats such as FLAC and DSD. Enjoy photo albums in beautiful high-resolution on your PC or TV just by selecting a folder or group of images and clicking "Play". No need to convert before you enjoy, with full RAW file playback support. Share your shots to Facebook and Flickr right from PowerDVD. Save time and effort. No comments for "CyberLink PowerDVD Ultra 18.0.2307.62 Multilingual".